Today, Louisiana’s new governor, John Bel Edwards, made the most of his first full day in office. Through an executive order, Gov. Edwards expanded Medicaid to about 300,000 uninsured Louisianans, many of whom will be eligible for health coverage for the first time. This move makes Louisiana the 31st state to extend the benefits of the Affordable Care Act (ACA) to its lowest-income residents. Edwards’ action marks a big win for community leaders in Louisiana – and the culmination of a long fight for health care justice. The battle began in 2012, when the Supreme Court ruled that states could opt out of the Medicaid expansion. Emboldened by this decision, former Louisiana Governor Bobby Jindal dug in his heels and refused federal funding rather than make health care available to his constituents. This intransigence resulted in Louisianans going without a potential 7,600 mammograms and 28,000 cholesterol screenings each year, according to one estimate. The state was also losing out on an average $1.5 billion in federal funds annually. A diverse coalition of organizations fought back. A Community Voice and Southern United Neighborhoods – partners of the Alliance for a Just Society – joined this fight, knocking on hundreds of doors, holding community meetings, and rallying in Baton Rouge, New Orleans and elsewhere. 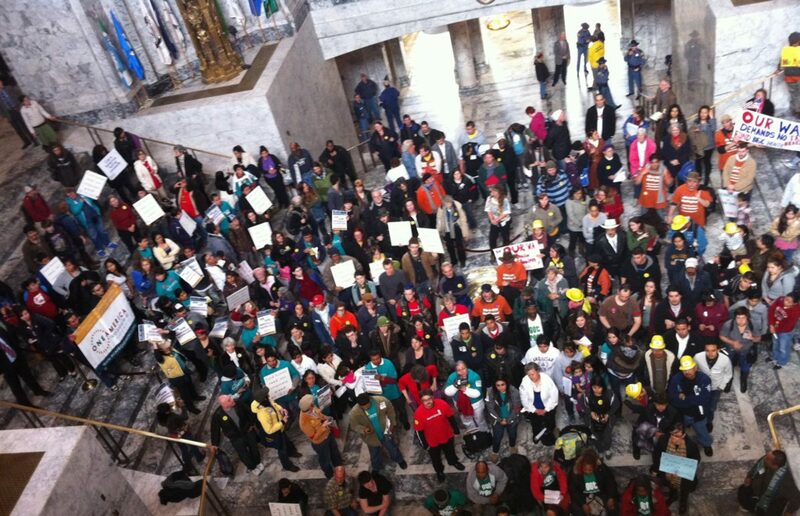 As the issue played out in the legislature, they showed up again and again, undeterred by setbacks. 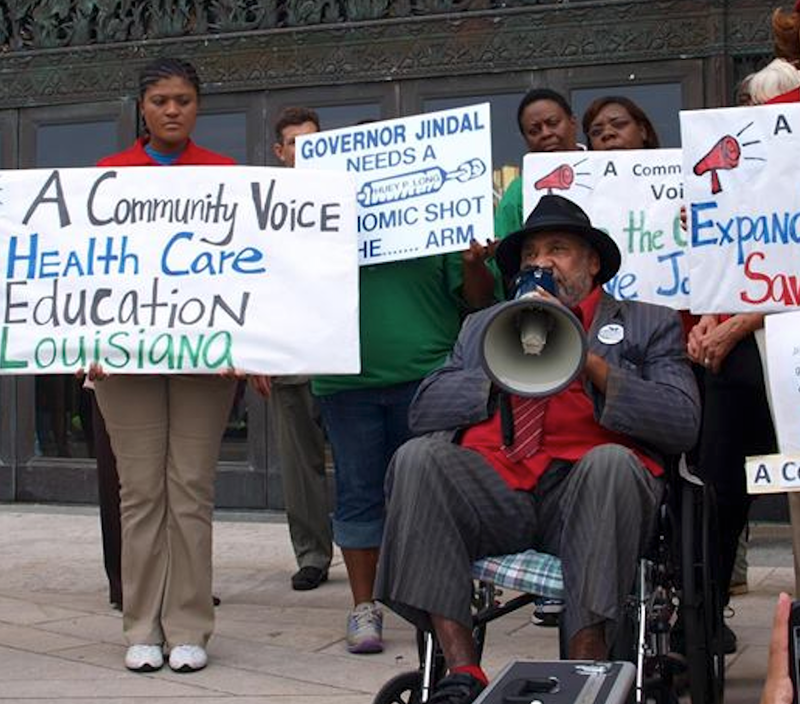 In 2015, with Jindal’s term coming to an end – and his popularity plummeting – A Community Voice and their allies made a final push to place Medicaid front-and-center as the race for governor was taking shape. Meanwhile, they kept the heat on the legislature. These efforts bore fruit in the spring, when lawmakers passed a resolution allowing the incoming governor to pick up the Medicaid expansion without further legislative action. From there, it was a matter of keeping attention focused on Medicaid as the candidates vied for governor. When Bel Edwards won in November, he assured Louisianans that Medicaid would be one of his top priorities. His executive order makes that promise a reality. Louisianans eligible for Medicaid expansion should begin receiving their coverage by July. Community leaders have a lot to celebrate. “Years of base-building, actions, and skirmishes have led to the day when the people have won health care for another 300,000 Louisianans,” said Lanny Roy, ACV president. Meanwhile, millions of other low-income people, disproportionately people of color, remain without coverage in the 19 states that have yet to expand Medicaid. Today, Louisiana points the way.